Technology Center Seestadt in Vienna, Austria, has got one of the main buildings sunlight lit via the Parans system. The sunlight via Parans’ luminaires together with LED-lighting creates a “light shaft” at the entrance. 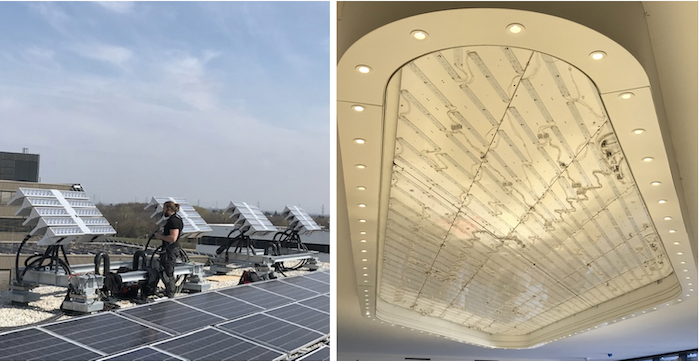 One of the entrances at the technical center in Vienna will welcome the visitors with a strong (1000 lux) sunlight lead in by the Parans system. The Parans light flows 15 meter above the entrance floor. The end customer promotes modern architecture and open spaces. There is an awareness that pleasant office environments are created with daylight. As for many buildings, a large part of the roof is covered by solar cells, which prevents infringements of the roof. Instead of seeing the limitations, the customer has chosen to see which possibilities are created with other available technology and chosen to use the Parans system to create an artificial light shaft. Parans so called Point Light has been placed at an equal distance at the outer part of the installation (see image above to the right). The people in the building will be welcomed by a strong natural light, just as the ceiling were open or had a skylight. - No one wants to, or should, waive daylight in buildings, but at the same time there could be limitations to bring the sunshine in via windows, says Anders Koritz, CEO at Parans. In this installation we see how the architect has used available technology to, as the purpose where from the beginning, to bring the natural light into the building. Also this time in an experience filled way, but via a fiber optic cable. The installation is a fantastic inspiring example of how a “heavenly light” could be created without ordinary windows.